St. Patrick's Day is a fun holiday. It's full of parades, dancing, special foods and a whole lot of green. So, getting into the spirit of St. Patrick's Day we thought that we would join in with the celebrations and get creative. Are you looking for a fun activity to do with your children? We have the perfect recipe for you. What could be better than some shimmery, shiny, glitter filled playdough with lots of sequins and shamrocks for good measure. A very simple and easy recipe to make your own playdough. First off, you'll need to mix the plain flour, cream of tartar and salt in a bowl. Then add the oil and the water. It's during this step that I recommend that you add any food colouring you wish to the water to prevent any staining on your hands. Then continue to stir until it all comes together. Leave in the bowl to cool. Once the mixture is cool enough add to a dry surface and knead, knead and knead some more. I would actually say that this is an important step and this will make the mixture more pliable. Store in an airtight container or zip lock bag and it can last for months. We like to store our playdough in the fridge. COLOUR - For this St. Patrick's Day playdough we added a few drops of gel food colouring, a lovely vibrant green. I did find that by adding the colour to the hot water first will prevent any staining. No wants any green hands, do they? SMELL - This is a great one for sensory play. Add a scent to your playdough by using essential oils, dried herbs, spice, lemon juice, coffee, cocoa powder or even fruit juice. The possibilities are endless. TEXTURE - To add a texture to your playdough you can add ingredients such as rice, lentils, pasta. You could also try adding glitter, sand, sequins, gems, or seeds. 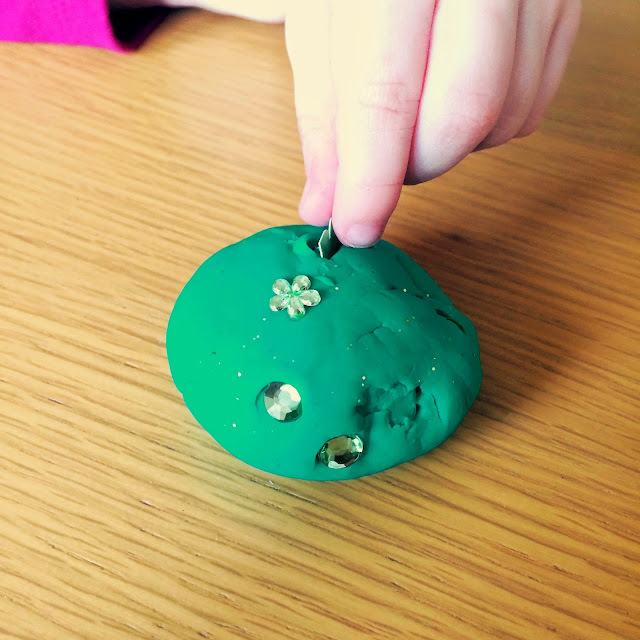 5 comments on "St. Patrick's Day Playdough "
I love adding the little extras to make this perfect for St Patrick's Day!